Big hitting Jean Bourbeau has signed a two way deal with the Bridgeport Sound Tigers of the AHL and Odessa Jackalopes of the CHL. As of the time of writing this post Jean is still with the Sound Tigers team and we hope he sticks. We also noticed, as the local media pointed out a few weeks ago, that former Squirrel Captain Dustin Friesen is at the same camp. I guess you only get noticed in this town if you have a big red tail, a well financed PR department, and the local newspaper as a corporate supporter. Things that make you go hmmmm?? During his four year stint with St. Thomas, Bourbeau recorded 19 goals and 23 assists for 42 points with 116 penalty minutes in 98 games. Way to go Jean, best of luck to you. Photo credit: Power Plus Hockey Skating Inc. The St. Thomas Tommies head south to play NCAA competition this weekend. On Saturday night at 8 PM(ADT) the Tommies take on the Northeastern Huskies at the venerable Matthews Arena in Boston, Massachusetts. Andrew Andricopoulos returns to his home state to lead STU into battle against the highly ranked Huskies. The game will be web-cast by GONU.tv. This is a pay per view event which cost $8.95 US and can be accessed by clicking HERE. On Sunday afternoon the team travels south to Milford, Connecticut where they will take on the Pioneers of Sacred Heart University. Game time is 4:30PM (ADT) and you can follow the action with Gametracker (FREE) by clicking HERE. The rookies were the story at this afternoon's STU/U de M game. Rookie keeper Kristin Wolfe and rookie forward Katie Brewster did all the damage as the Tommies defeated Moncton 2 to 1. Wolfe was hit with 41 shots and only one goal eluded her at 5:31 of the first period. Late in the second frame Kristin would make at least three glorious saves on odd man rushes. Katie Brewster scored the game winning goal, her first as a Tommie, at 18:10 of the 2nd frame as she ripped a wrister past the Moncton keeper. Charity Walls got the first STU goal on the PP at 11:24 of the first with assists to Laird and Burns. Wolfe did the rest and made the one goal lead stand up. Shots on goal were 41 - 23, advantage Aigles Bleues. While the shots on goal do not seem favourable, STU had extended periods of pressure in Moncton's zone in the each period and controlled the play for a long stretch in the third. Lucrece Nussbuam was foiled on a penalty shot midway through the second frame. (see video) This years crew will be heard from. The Lady Tommies played their first game of 2009-2010 and came up on the wrong side of a 3 to 1 score against reigning AUS Champions Moncton. Les Aigles Bleues scored twice in the first period and wouldn't look back as they scored one more in the second to take a commanding 3 to 0 lead. Amy Kelbaugh, with her first as a Tommie, scored to break the shutout bid with the only assist going to Charity Walls. STU went 1 for 2 on the PP and were perfect on the PK foiling all 3 attempts by Moncton. Julia Sharun got the start in net with the final shots on goal favouring U de M 43 - 27. These 2 teams will be back at it tomorrow afternoon, game time 3 PM at the LBR. Any night you win is a good night but tonight was great for two rookies, Charles the Great and Great Scott. Our rookie goaltender faced 51 Moncton shots and our rookie forward scored a late third period marker for a 3 to 2 Tommies victory. The Tommies started out the night short handed as Tyler Dietrich was serving a suspension and Matt Eagles did not play. Wes Welcher and Andrew Andricopoulos scored in the first period and Charles Lavigne made an outstanding save on a clear cut breakaway to preserve the lead going into the second frame. Moncton scored two goals in the second period on a deflection that went high and a broken play with a U de M guy all alone in tight. This after three STU regulars, at the start of game, left with injuries. Scott Judson debuted at left wing after being a healthy scratch on the Island last weekend and Andrew Estey returned to the line-up. With STU having a depleted bench, the shot clock favoured U de M in the third but Jordan Scott got the winner late in the period after Erick Tremblay fired a cannon shot on goal. Moncton pulled the goaltender and tried to tie but Lavigne shut the door. Wes Welcher and Mike Reich both contributed late by winning some big face-offs when it mattered. Final shots were 51 to 19 for Les Aigles Bleus. The Tommies next game is against the Northeastern Huskies next Saturday night. It's a Moncton Weekend. 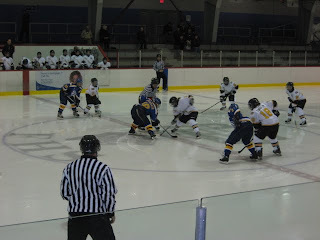 Both hockey teams will do battle with the Aigles Bleu(e)s this weekend. The Ladies play their first games of the preseason with a home and home series starting in Moncton at 6 PM on Saturday night and returning to the Lady Beaverbrook on Sunday at 3PM. The Men play their third preseason game against Les Aigles in Shediac Friday night, with game time at 7 PM. The St. Thomas University Men's Tommies are nothing if not consistent so far this exhibition season. After falling 8-1 to the mighty Squirrels on Tuesday night, our boys in Green and Gold suffered the identical fate to the UPEI Panthers in Charlottetown tonight. New addition Charles Lavigne got the start in goal for STU and looked particularly good with a huge breakaway save late in the first. But the Panthers would take a 1-0 lead into the first intermission, outshooting the Tommies 9-7. The Tommies couldn't capitalize on several second period chances and the Panthers unleashed 4 more goals to lead 5-0 after 40 minutes. UPEI outshot STU 11-9 in the middle stanza. The Tommies have one more chance to get on the winning track before heading to New England against NCAA competition, as they face UdeM in Shediac next Friday night. Novelist, essayist, and screenwriter David Adams Richards will be the guest speaker at the sixth annual St. Thomas University Women’s Hockey Media Night on Friday, Sept. 25 at 6:30 pm at the Fredericton Inn. The event is the major fundraising activity by the team and includes a meal, silent auction, and a talk by Richards based on his national best-selling book Hockey Dreams. Tickets are $25.00 each and are available by calling John Waite at the Fredericton Inn, 455-1430. Read the full STU Athletics release HERE. The Tommies have also tried to subtly drop the name of another recruit past us. Andrea Fischer of Bern, Switzerland, a forward, will be suiting up for the Green and Gold, joining her county mate Swiss Olympian Lucrece Nussbaum. In today's Daily Gleaner, Bruce Hallihan's article "Tommies aren't ready to give the Varsity Reds a run just yet" breaks down a few elements of last Tuesday's game versus the Squirrels. This quote by Bruce just about sums it up in an acorn shell. That said, the 2009-10 Tommies will be better than the 2008-09 Tommies, who won just two of their first 19 AUS men's hockey conference games. A better barometer will be Friday's pre-season game against the UPEI Panthers in Charlottetown. UPEI isn't UNB - national champions with a reloaded lineup. It was the first exhibition game of the year, sure the score wasn't flattering but it doesn't count for a hill of beans. Every Tommies fan out there would have enjoyed it more if the team could have kept it closer, but it was the "reloaded lineup" of the "national champions". Let's keep things in perspective and realize that STU did have a very good recruiting season and we have plenty to look forward to. Don't get caught up into UNB's fans comparisons of their team to ours. We aren't there yet, but we're building. Squirrels tear Tommies a new one....again. It was much the same Presidents' Cup game as last year. The Tommies started things off on the right foot scoring at 1:35 of the first with Max Chamberland getting credit for the goal from Banfield and Andricopoulos. The lead stood for the first period before UNB took control with eight goals over the final two periods. Final shots on goal favoured the Squirrels 45 -19. Next game for the Tommies is Friday night versus PEI in Charlottetown. We move on. Exhibition season gets under way tonight. Welcome back hockey, we missed you! The Tommies exhibition schedule starts tonight at Willie O'Ree Place at 7 PM. STU will host UNB in the 4th annual Presidents Cup game. A great test to get the season underway. Rookies to watch for tonight are #7 Alex Labonte, #11 Jordan Scott, #12 Tyler Dietrich, #22 Mike Reich, #35 Charles Lavigne, and #36 Matt Eagles. Tickets are available at the J.B. O'Keefe Fitness Centre today until 4 p.m. Tommies season passes will be honoured at the door. Admission is $8 for adults, $5 for seniors and $3 for students and children. The St. Thomas Tommies have added arguably the best 20 year old goaltender coming out of the Canadian Hockey League. Charles Lavigne had a phenomenal season this past year recording a QMJHL best 6 shut-outs, 2nd best goals against average (2.37), and tied for 3rd best save percentage (0.916). Charlie was also a 2008 - 2009 QMJHL all-star and was the Q defensive player of the month for January. He played 51 regular season games for the Quebec Remparts under the tutelage of Hall of Fame goaltender Patrick Roy. He led the team to the semi-finals while almost single-handedly disposing of the Cape Breton Screaming Eagles in 7 games, shutting out the Eagles in the last 2 games of the series. Other top goaltender recruits this year are Bobby Nadeau of Dalhousie (3.24, 0.904) and Travis Yonkman of the University of Alberta (2.92, 0.902). Mike Eagles has shored up his most important defensive position and this is an exciting announcement. Daily Gleaner: Tommies land a top stopper Just a quick correction in today's Gleaner. In the seventh paragraph it is suppose to read "Based on Goalies’ World magazine’s computer rankings, Lavigne was the third-best goalie in the QMJHL last season. He accumulated 104.0 points, trailing only Nicola Riopel of the Moncton Wildcats (106.8) and Fredericton’s Jake Allen of the Montreal Junior (104.7)." Thanks for the heads-up Bruce. Ordinarily you might start this post off by saying congratulations to all SIXTEEN of our hockey Tommies that achieved Academic All-Canadian standing but it would be more appropriate to say GREAT WORK and a lot of it. This is no small accomplishment for our student athletes and we are very proud of our St. Thomas Tommies listed below. "The CIS recognizes student athletes as Academic All-Canadians for maintaining a grade point average of 80 percent or better over an academic year during which they compete in a varsity sport. " For the full St. Thomas athletics news release CLICK HERE.